Over 5,000 applicants were ready to take on this journey. The drive these people had was neither extrinsic nor financial. Their drive came from within. They wanted to be part of something extraordinary. The 27 men who ultimately accompanied Shackleton on his ship, Endurance, encountered many obstacles. The team was challenged to the maximum. While they failed to achieve their original goal, the expedition succeeded in an amazing feat of persistence and teamwork. The team survived due to the unique character and mettle of its members. This paper examines how people and culture, when tuned right, can deliver outstanding results. The core of the paper is a five-part People Model, in which we review selecting and investing in the right team, engaging and retaining the team, and listening to the team. But first, we turn to some quantitative research that demonstrates how the soft side of people can yield hard results. Another study was conducted by Jeffrey Pfeffer, a professor at the Graduate School of Business at Stanford University and author of The Human Equation. His work looked at the NYSE public companies that had the best stock appreciation in the twenty years between 1972 and 1992. There were five companies that stood above all others. What is interesting was that these companies did not start with large market shares or have special technology or patents. In fact, these companies were not even in high-growth industries. Instead, all were in highly competitive industries, vulnerable with low barriers to entry, and in sectors experiencing substantial losses and widespread bankruptcy. Yet these five companies each delivered shareholder returns in excess of 15,000% over the period studied. The companies were Wal-Mart, Circuit City, Plenum Publishing, Tyson Foods, and Southwest Airlines. Apart from Circuit City, whom we will address in a moment, each of these companies is still recognized as a leader in its industry. The common element that drove the success of these companies was a thoughtful human-resource strategy. These companies had cultures that emphasized growth, invested a lot in leadership training and overall skill development, established strong career paths, and offered superior pay for superior performance. By focusing intensely on the people and the culture, these companies created an environment that inspired the workforce to outperform, and the companies achieved terrific market performance as a result. Circuit City saw its shareholders earn a 16,410% return between 1972 and 1992. But with increasing competition, Circuit City’s leaders decided they needed to cut costs. So in March 2007, the company strayed from its focus on people and laid off more than 3,400 employees (about 8% of the total workforce). They announced they were removing the store associates “who were paid well above the market-based salary range for their role” so they could replace them with lower-paid workers. But the employees they removed – in addition to being the highest paid – were also the best performers. Over the years, those high performers had received raises and hard-earned commissions for their exceptional work. With the top performers out, Circuit City was left with severe knowledge gaps and a devastating blow to morale. By November 2008, Circuit City was in bankruptcy, and it closed its doors in March 2009. Had the company continued to focus on the people and organizational traits that had spurred their remarkable growth, they would have been able to remain afloat and compete for their share of the market. Traits are the compass that internally defines and motivates each one of us. They are hard-wired into each person’s psyche. Traits are different from skills and experience, which are what appear on a resume. Skills can be taught, but traits are innate. During recruiting, the focus should be on whether the candidate’s values fit into the company culture. Traits like being self-motivated and innovative can often offset a less-than-ideal skill set. As Bruce Nordstrom once said, “We can hire nice people and teach them to sell, but we can’t hire salespeople and teach them to be nice.” And Goldman Sachs hires brilliantly-smart people. But the company has learned that highly intelligent people often don’t work well with others. So Goldman candidates also need to prove a high degree of collaboration and teamwork. Trait-based interviewing gets into deep discussions about past behavior, motivations, and “what if” scenarios. Tools like Myers-Briggs Type Indicator®, the DiSC® personal assessment, or the Predictive Index® can prove useful to evaluate and screen candidates. Many organizations view employees as expenses or assets. But expenses cost you money today and assets depreciate over time. Employees should instead be viewed as investments. That’s why companies with growth-oriented cultures put employee development and career pathing as high priorities. In some positions, training is needed. Training comes into play when someone needs to perform a task over and over again in a specific way or learn industry-specific knowledge. Think of someone on an assembly line. The procedures have been set and the line has been tuned to best suit the task. The employee needs the training to learn how to perform a repetitious task efficiently. Being educated on a particular topic, however, goes beyond performing a task to also include understanding the broader objectives and parameters. Education can boost innovation and creative problem-solving. It is this education that helps spark organizations to challenge the status quo and make progress. In addition to training and education, companies can invest in employees by removing barriers to growth. If employees feel constrained, they are less likely to contribute. Indeed, in the right environment, even employees without the necessary “education” will become active in solving problems and improving the elements they can control. Overall, investments in training and education yield additional productivity and profitability, and set the stage for deeper employee engagement. Leaders engage employees. Leading is different from Managing; not all managers are leaders, and one doesn’t need to be in management to be a leader. Indeed, manager behaviors revolve around how to organize, coordinate, administer, and measure. There is a strong focus on the “what” is being done and “how” to do it. Management is about the left side of the brain. Leadership, however, comes from the right side of the brain. Leadership is about inspiring, innovating, and learning. Here, the focus is on “why” we do what we do. Companies with a people-centric culture invest a lot in developing and leveraging leaders. These leaders propagate a vision of the future and inspire employees to take part. Employee engagement can also come from a sense of empowerment. When people feel they are in situations where they are in control of their destiny and can perfect their craft, their productivity and effectiveness go up. 3M encourages its employees to spend 15% of their time on passion projects, which we can thank for our beloved Post-It notes (Google had a similar policy until August 2013). This creates a unique sense of autonomy, ownership, and entrepreneurship. Being self-directed encourages empowerment. Other contributors include an organizational acceptance of failure (mistakes are a chance to learn lessons), a flat corporate structure, and few status distinctions among the ranks – all of which help assure employees that they have “permission” to speak up to improve the business. Sharing information is another way to boost engagement. Extensive sharing of information – including financial performance, strategies, and operational measures – conveys trust and loyalty. Bringing employees into the data flow makes them act more as owners and underscores that the whole team is working together toward common goals. Most employees are not working out of the goodness of their heart. They need to be rewarded. To build a strong culture, companies should structure compensation to deliver superior rewards for superior performance. This includes cash compensation like salary, benefits, bonuses, and other incentives. These are vital to getting the right people on board. And the best bonus plans tie payouts clearly to the company’s bottom line. These extrinsic rewards help recruit employees, but more is required to ensure they stay. General Electric’s Jack Welch was famous for sending personalized thank-you notes to employees. These letters were often framed by the recipient and valued much more than a spiff or bonus. Companies need to create non-monetary ways, specific to their corporate culture, to celebrate and reward stellar employee behavior. As we saw in the Circuit City case study, keeping the right people employed can make all the difference. A company’s culture evolves over time. As such, it’s important to listen to employees and adjust appropriately. Measuring employee engagement can be as easy as conducting a survey. The Net Promoter methodology is a straightforward approach that can be applied to customers and employees alike. For more about Net Promoter, see our white paper, Winning with Customers, found at CustomerThrill.com. A survey could start with the key question: “How likely are you to recommend working at [Company X] to a well-qualified acquaintance (to a friend or someone you know)?” Answers are put on a scale of 0 (Not likely at all) to 10 (Very likely). Other questions can then dig into an employee’s rationale and feelings. What keeps you at [Company X]? Is there something important that [Company X] should start doing? Is there something important that [Company X] should stop doing? Is there something important that [Company X] should continue doing with more gusto? This kind of survey will yield useful information in the journey to improve a company’s culture. So will constant communication and feedback between managers/supervisors and employees. Periodic employee reviews and 360° evaluations can help, too. The learnings that organizations have in this process help to improve the culture. Berlin Packaging is a leading supplier of rigid packaging. The packaging market in North America grows at 2-3% per year, but Berlin Packaging has grown at more than six times the market rate for the last two decades. There are many factors contributing to this success, but a focus on people and culture has been central. Described below are some of the ways Berlin Packaging develops and nurtures its culture. We demonstrate more passion and effort, creatively so and consistently so, compared to others we compete with. We go above and beyond in the pursuit of thrill for our customers and success for Berlin Packaging. We are the best at what we do. Berlin wants optimistic, competitive employees. It wants people who want to achieve more, challenge the status quo, and win. It wants people who aim to be Greater, Faster. You can learn more about this culture in a paper titled The WHY, HOW, and WHAT of Berlin Packaging, available at GreaterFaster.com. 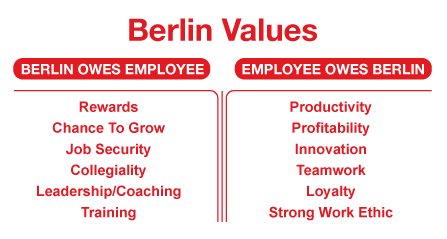 More than 20 years ago, Berlin Packaging adopted a set of values that govern the employee-employer relationship. The values are laid out as a T-chart, which shows the mutual obligations of the company and the employees. On the left side, Berlin Packaging owes its employees six elements, including rewards, career-growth options, job security, and leadership. On the right side, employees reciprocate by providing productivity, profitability, innovation, and teamwork. These Berlin Values are discussed during employee reviews, day-to-day feedback, and even in exit interviews. The feedback helps the company determine what needs to improve to make the company and employees grow. Just as it does with customers, Berlin Packaging uses the Net Promoter approach to tighten ties with its employees. Employees are asked “How likely are you to recommend working at Berlin Packaging to a well-qualified acquaintance?” The answer to this question, along with other questions that delve into the reasons for the answer, provides data on employee engagement and ideas on how to strengthen engagement – and therefore productivity – over time. Creating a competitive advantage through people is a long-term endeavor. The right next steps will depend on how healthy and appropriate your culture is today. There are some simple actions you can do to assess your starting point and begin building from there. Regardless of job or function, what are the essential traits that every employee must display? This can relate directly to your company’s strategy, competitive positioning, and business model. Getting alignment on this will create the lens through which many other topics are viewed, including hiring, training, motivating, and rewarding your team. Get a sense of how your employees feel about working at your company. An easy way to do this is via a Net Promoter survey like the one described earlier in this paper. Taking the pulse of your organization can reveal your strengths and areas of opportunity. If you find areas for improvement (as you undoubtedly will), start by addressing a few issues that can be resolved over the short term so that you can show some progress quickly. If you find a lot of positives (as you hopefully will), be sure you embrace them, too. It’s important to celebrate what is going well in your culture to ensure that neither you nor your employees take it for granted and let it slip away. For both positives and negatives, communicating what you’re hearing and what you’re doing about them is an important part of the process. Red (wrong traits and poor performance). The Green bucket should be retained and motivated; these are your stars. The Yellow bucket needs to be trained or redeployed; they have the right traits and should be given a chance to show they can perform. Companies must also address the people that do not have the right traits and attributes. The Red group should be fired; they are not the people you want to have on your team. Some companies have trouble figuring out what to do with the Orange group; they are performing, after all. But the failure of the Orange group to demonstrate the right traits clouds the clear cultural signal you’re trying to create. So this group should be fired as well. Today’s supply chains are tightly linked. Companies rely on one another to perform. As a consequence, it’s not enough to only consider your own culture and employees; you should also look to the culture of your partners. You want to be in the “business foxhole” with like-minded and like-motivated people. All of these getting-started steps will help define areas for action and further investigation. Cultural change must start at the top and include leadership at all levels. Without clear messaging and actions that are consistent with the message, any effort at improving culture will fail. Top-performing companies succeed because of smart human-resource strategies that put people first. Companies that wish to build a competitive advantage through people would be wise to follow a five-part People Model. First, carefully select employees based on traits and attributes rather than specific skills. Second, invest in employees with training and, even better, education around goals, metrics, resources, and known obstacles. Third, engage employees with inspirational leadership, a sense of autonomy and empowerment, and free-flowing information. Fourth, retain employees with competitive compensation and a celebration of the best behaviors and accomplishments. Finally, measure employee engagement and find ways to improve. Combined, all of these steps will set a course for building a team that will carry your company to the top. In today’s economy, with companies more linked than ever, you should also consider the culture and people at the companies you’re connected to – suppliers and customers alike. Ultimately, the winning supply chains will have the most ambitious, well-curated approach to people. 1Find the study at www.booz.com/global/home/press/displays/corporate-culture-is-critical-to-business-success.